The outer layer of the skin (epidermis) gets thinner. The skin loses strength and elasticity, especially in areas of the skin that see a lot of sun. This can lead to a leathery appearance. Collagen keeps the skin plump and firm during your younger years, but collagen production declines with age. The number of skin cells that have pigment in them (melanocytes) decreases. At the same time, the melanocytes that are left grow larger. This makes aging skin look pale and translucent, and also leads to skin discoloration in the form of age spots. Your skin produces less oil over time. This causes skin to dry out, which can age skin even faster. The combination of a loss in skin elasticity, lower collagen production and gravity all contribute to the development of wrinkles. There are other side effects associated with aging skin too. For example, many people bruise more easily as they age. Older people are also more likely to develop skin growths like warts and skin tags. The chances of developing skin cancer also increase with age. Choose a dermatologist at Ascension Seton for your cosmetic dermatology treatments. Find a doctor or find a location near you to take the next step. Although nothing can stop the aging process entirely, a good daily skincare routine is the best defense against aging skin. Sun protection is critical in preventing skin damage and slowing the formation of wrinkles. Use sunscreen every day, avoid midday sun exposure and wear protective clothing like sunglasses and wide-brimmed hats to shield your facial skin. Collagen levels are even lower in sun-damaged skin. Quit smoking or don’t start, as smoking can damage the skin dramatically. Stay healthy by drinking plenty of water, working out and eating a good diet. All of these can help maintain youthful-looking skin. 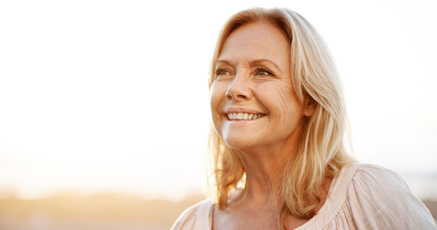 Because aging is a normal occurrence, no diagnosis is necessary. However, there are four different types of wrinkles that can form. Knowing the difference between these can help determine the best treatment to use. Atrophic Crinkling Rhytids: These are fine lines on the face that are caused by loss of collagen and elasticity. They run almost parallel to each other. Permanent Elastic Creases: Seen most often on the cheek, upper lip and on the lower neck, permanent elastic creases are crease lines in the skin. They become more permanent over time, and get worse with sun exposure. Dynamic Expression Lines: Normal muscle movement during facial expressions causes these dynamic wrinkles. Frown lines (between the brows) and crow’s feet (at the outer corners of the eyes) are good examples. Gravitational Folds: Gravitational folds are deeper lines that develop due to gravity and a loss in skin thickness. They get more noticeable over time as gravity continues pulling downward. Once the signs of aging are already visible, there are many treatments that can help minimize wrinkles. Regular use of an over-the-counter or prescription retinoid (retinol, Retin-A) can help improve the appearance of fine lines and wrinkles. Retinoids promote collagen growth to plump and firm the skin. Chemical peels, microdermabrasion and laser resurfacing can improve the appearance of lines and wrinkles and make your complexion more radiant. Botulinum toxin (BOTOX®, Xeomin®, Dysport®) paralyzes facial and neck muscles. This lets dynamic wrinkles on the overlying skin smooth and soften. The effects are temporary and last between four to six months. Wrinkles caused by volume loss can be treated with injectable fillers (Restylane®, JUVÉDERM®, BELOTERO®, etc.). Depending on the product, the filler stays in the skin anywhere from six months to two years. Your dermatologist can go over all these cosmetic options with you. Your first visit will be spent talking about the changes you’d like to see in your appearance. From there, you can decide together which procedures or products will give you the best results. Your skincare routine should be ongoing to help improve existing wrinkles and slow the aging process. Some specific treatments mentioned above may have short-term side effects related to the treatment. For example, injectable fillers may cause initial irritation at the injection site, while laser resurfacing may leave your skin pink and tender for a day or two. In order to maintain your results, continue protecting your skin from the sun. You should also use age-appropriate facial cleansers and creams as suggested by your dermatologist to give your complexion the right level of nourishment.